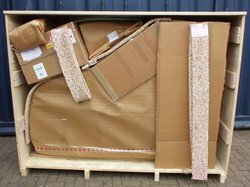 Moving a piano can be a major obstacle if you don’t have the experience of moving pianos. If the thought “It’s not that heavy” has crossed your mind then more likely it probably is. If you happen to drop or break a piano, a replacement or repairs could cost you thousands. Pianos are large and awkwardly shaped which makes for packing extremely tough and time consuming for residential moves. Save yourself time and money by hiring a professional piano mover to handle the job. If you’re serious about moving your piano right, it’s best to go with a professional piano mover. Be sure to ask prospective moving companies about their insurance coverage. In the vast majority of cases, the amount of insurance they carry will be more than enough to cover your piano. If it doesn’t, or if you’d like additional coverage, contact your homeowner’s insurance agent and ask about arranging for a rider to your policy that would insure the piano while it’s being shipped. Occasionally, piano movers may attempt to “keyboard” a piano in order to move it: this entails removing the keyboard so that the piano can fit through tight spots. Let your mover know prior to the move that you don’t want this done. Some piano movers won’t come to your home. Make sure the piano mover you select will provide door to door service. As the potential mover where the piano will be placed during the move. Make sure movers place it somewhere where it won’t be subject to major shifts in movement or temperature. Even minor warping, caused by small temperature changes, can affect a piano’s sound. Keep the piano away from heating ducts, windows and doors to avoid destroying the piano. The right professional piano mover will have special tools for the job; like a piano dolly, a heavy duty handcart that can support a piano’s weight and a piano board that can ease big loads down stairs with minimum turbulence. Wrapping the piano in a series of blankets and pads so that the surface of the piano isn’t scuffed or gouged (refinishing a piano can be almost as expensive as replacing it). Piano’s are delicate, internal moving parts will need to be secured as well. Making sure the piano is moved in a way that avoids damaging bumps and scrapes is a piano mover’s second most important task. Moving a piano is a complicated process. There is risk to the piano, risk of bodily injury to the mover and other people and risk of damage to other property. Although moving a piano may seem to be an easy process, hidden factors compound the task. Pianos are difficult to move and should only be moved by a professional who is careful, properly trained, insured, and has the proper equipment. An upright piano is the most common and is more easy to move than a grand piano. 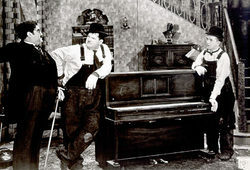 It is moved by tipping the piano and sliding a piano movers’ dolly underneath or lifting the piano up onto the dolly. The dolly has a strong frame for moving and large rubber wheels for ease of moving and not scratching the floor. The piano is transported to its new location and removed from the dolly. The piano should be covered to prevent being scratched or damaged. The wheels attached to a vertical piano itself are rarely designed for moving, and are primarily used for cosmetic effects. With a studio piano that has larger, double wheels, it is designed only for short moves. When moving a studio piano beyond the immediate room or for more than just a few feet, a dolly should still be used. A grand piano is moved by covering the piano, fitting the ‘skid board’ with strong webbing, removing the pedal lyre (since it does not support any weight) followed by the left leg, and gently lowering the piano over onto the straight side. The lid is allowed to overhang the side so as to not pressure it. The piano is blanketed, strapped down and the other two legs are removed. Additional care should be added to ensure that the piano parts that can rub together and scratch must be secured. 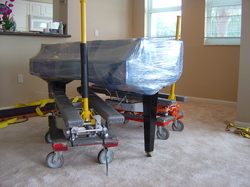 The skid board with the piano is tipped and a piano movers dolly is slid underneath for transport to its new location, where the procedure is reversed. Unfortunately not all carriers fit the ‘skid board’ at the early stage. Contrary to popular legend, proper piano moving does not affect the tuning. Tuning is affected by changes in humidity. If a piano is properly covered during the move, it will not feel the environmental changes such as going from indoors to outdoors and back indoors again. The piano could go out of tune if exposed to a climate change such as going from a dry home to a humid home.